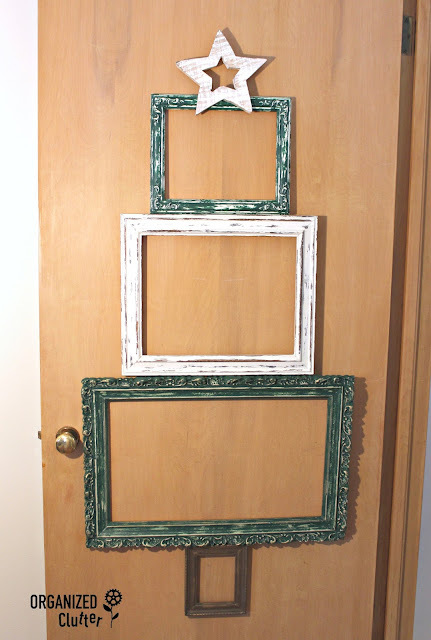 My Christmas project today starts with this pile of thrift shop frames. The sizes are, measured from outside edges, 12" x 10", 14" x 17", 17" x 24", and 5 3/4" x 7". 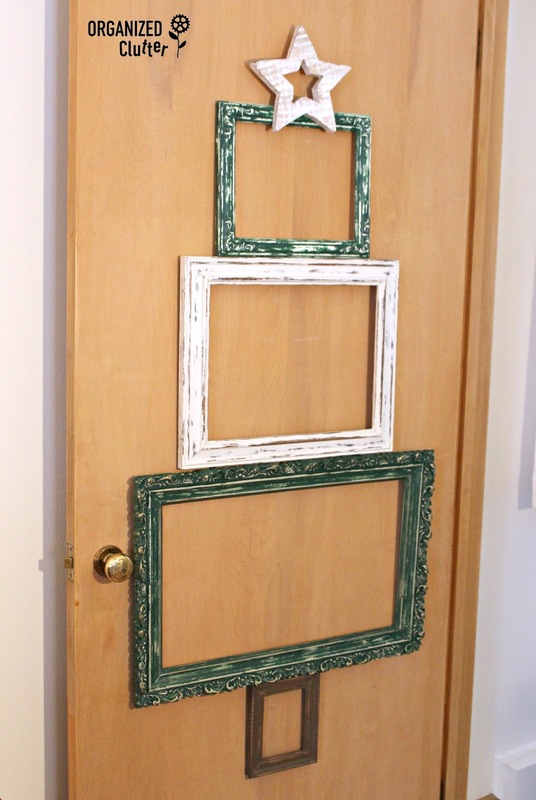 I recently purchased a tester pot of Annie Sloan Chalk Paint in Amsterdam Green. This project was a good one to test out Annie's new shade. The green is very dark. But after I wet distressed the paint with a damp terry rag, I liked the color, a lot. I painted two of the frames in Amsterdam Green and one in an off white Dutch Boy Chalky Paint Antiquated White. The Dutch Boy paint is available at Menards. The tree trunk was painted with Annie Sloan's new color Honfleur. I sealed the frames with a coat of Varathane water based matte poly. I used National Hardware Corner Braces in the 1 1/2" and 2" size to connect my frames from the back. My wooden star is from Raz Imports, and purchased at a local floral shop. I removed the eye screw and jute string and screwed it to the top frame. A saw tooth hanger is attached to the top frame. This was a fun, easy and inexpensive Christmas project! Great idea, good place to hang it too. We had our first snow Friday in into Saturday and now the big melting has started. (lower mainland coastal BC). Creative way to make a tree! I like the green color, green is the color of 2017, I've heard. Any plans for ornaments, or leaving it as-is? 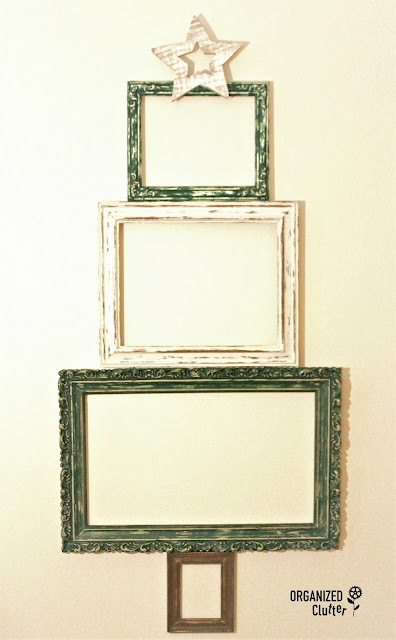 Would be a fun way to display small family photos inside the frames. You're having fun! That is such a great idea. I wish I had room for something like that. Sweet and I like the above idea of chicken wire for photos, cards etc. Amazing idea! I already start looking for frames!